WHAT IS EEG? An electroencephalogram (EEG) allows us to measure the electrical activity of the brain. During an EEG, we place small sensors on the scalp (see picture below). These sensors allow us to monitor and record brainwaves. 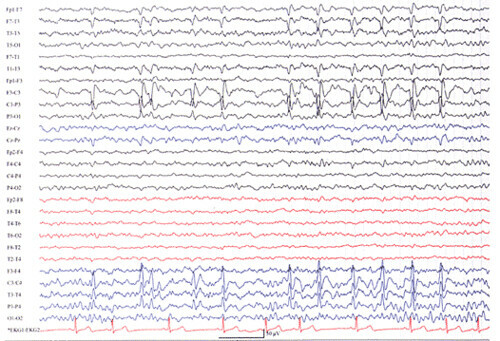 WHAT HAPPENS DURING AN EEG STUDY? We will first measure your head to determine which cap size you will need. The caps are a bit like swimming caps, but they are full of holes for us to attach the sensors to. We will then fit the cap and begin to attach the sensors to the cap. Each sensor is filled with a salt-based gel, and is connected to an amplifier and an EEG recording machine. When the electrodes are in place, lots of wavy lines appear on our computer screen. These wavy lines show us your electrical brain activity! Since it takes a little while for us to attach all the electrodes, we can put on a TV programme or film for you to watch while we do this. Once everything is set up, we will ask you to complete a computer task. The task usually lasts about 30 minutes but you can take regular breaks. These are the brainwaves we see on our computer screen! Yes! There are no known risks or side effects associated with having an EEG. An EEG is non-invasive and painless. CAN ANYONE TAKE PART IN AN EEG STUDY? While most people can take part in our EEG studies, not everyone can. Participants in our studies need to be native English speakers, right-handed and free from current psychological and neurological diagnoses. Participants also need to have normal hearing, and normal, or corrected-to-normal, vision. Before taking part in our EEG studies, we will ask you to fill out a questionnaire about your family and medical history to make sure it is safe for you to take part. HOW DO I PREPARE FOR AN EEG STUDY? There isn’t much preparation for an EEG. Your hair should be clean and free of any hair products since products in your hair can interfere with our electrode recordings.